So, yesterday I decided to do something a little bit different. Rather than interviewing a brew master or someone trying to open a new brewery here in Manitoba (though that is coming), I decided to sit down and chat with Colin Enquist of 49th Parallel Group. For those of you who do not know Colin, he is a 30 year old graduate of the creative communications program at Red River College who aspires to someday be a screenwriter. For now, he has the very interesting job of being the territory manager for 49th Parallel group here in Manitoba. 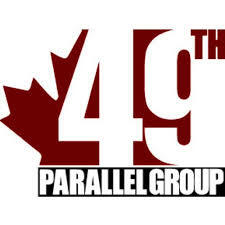 49th Parallel group is an agency that specializes in the marketing, selling and promoting of craft beer in Western Canada. Representing 20 breweries across North America, the goal of the group is to help spread the wealth of craft beer into various marketplaces and dealing with all the red tape that comes along with it. Colin, like most of us, started off not really liking beer. It wasn’t until he moved to Edmonton where he really got into beer. He was out one night and wanted to have a drink, so he grabbed a beer, “It was a Kilkenny Irish cream, not a great beer but it was new to me”. From that point Colin says that he was hooked on trying new beers. When he moved back to Manitoba he started meeting people who were into craft beer and growing his interest. He met his good friend Adrian Trimble, with whom he hosts the great podcast “Pubchat”, and eventually had the opportunity to work for 49th Parallel group representing craft breweries here in Manitoba. Colin started off doing this gig part-time while he went through the creative communications program. When he graduated he was offered the job full-time and has been working there ever since. For about 2 ½ years Colin has been working hard to try and get craft beer onto the shelves of the Manitoba Liquor Marts. This mostly entails making sales calls to the LCs, being the contact if there are problems or questions, doing tastings and training and most of all “trying to educate people about craft beer”. It also involves writing beer themed recipes and doing a “beer and book” pairing from time to time as well. You’ll have to follow him on twitter @49thparallelmb to get the beer and book pairings. I asked Colin about the biggest difference he notices between provinces. Colin told me that it’s what sells. Here in Manitoba we are mostly a “can market”. Beers in tall-boy cans seem to sell better here than in other markets. “This may have to do with the cabin lifestyle” Colin told me. This is different in other provinces “In Alberta it’s mostly 6 packs and the 650ml bottles do really well”. We also talked a lot about craft beer, obviously. Since Colin is someone who has the opportunity to drink so many beers I wanted to know his favorites. He told me that Stouts are his favorite style of beer and that right now his favorite beer is probably Ten Fidy Russian Imperial Stout made by Oskar Blues. When it comes to breweries he’d have to list Flying Monkey’s, “I love pretty much everything they do”, and Oskar Blues out of Denver. Colin and I also talked about the red tape and all the challenges in place to getting the beer on the shelves in the province of Manitoba. When you compare our craft beer market to that across Canada we are really quite far behind. When you look at a city like Vancouver with over 1000 breweries compared to Winnipeg where we have two, (three if you count the Brewing and Malting Barley Research Institute), you can see the vast difference in growth. While there is progress being made, it’s slow but Colin did say that he noticed a huge difference in the knowledge of attendees at this year’s Flatlander’s beer festival compared to the last two years. We are also seeing for the first time an upswing in potential breweries opening. With Peg Beer Co, and Barn Hammer Brewing Company announcing their plans to open, we are seeing progress here in Manitoba. So, keep your eyes peeled for those as well as the rest of the awesome stuff they bring to the shelves. I have to say, it was really great to sit down with Colin and chat with him about beer. His knowledge about beer is just phenomenal. As someone who is passionate about beer and brewing it’s also nice to sit down with someone who has that same, if not higher, level of passion. It’s great to know that there are people like Colin and the 49th Parallel group working hard to get craft beer into Liquor Marts and to help these breweries thrive. So, be sure to check out the beers at your local liquor mart, check their website for the new products arriving and be sure to follow Colin on twitter @49thparallelmb to get the latest news from the source. You should probably also follow me on twitter @beerwinnipeg if you haven’t already. Next for me is I’ll be sitting down with Nicole Barry of Peg Beer Co to chat with her about opening a new brewery here in Manitoba. I also hope to be able to sit down with the folks at Barn Hammer, and of course, I’ll be posting about the progress of my homebrew and reviews of beers I try.